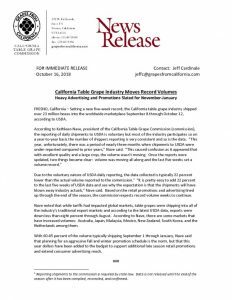 At a crop value of $1.81 billion in 2017, California table grape growers harvested over 109 million boxes of grapes, sending them to consumers worldwide. There are approximately 450 table grape farming operations in California. California produces 99% of the table grapes grown in the United States. 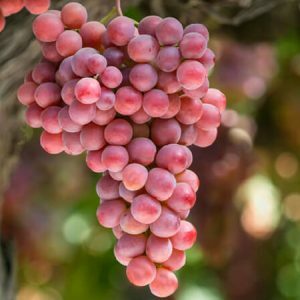 Per capita consumption of table grapes in the U.S. is more than 8 pounds per person and 35% of the crop is exported to more than 55 export markets. Coachella Valley and San Joaquin Valley are the table grape growing regions in California. 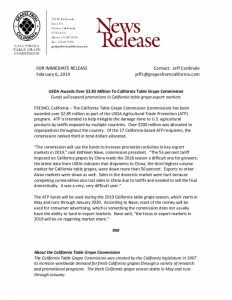 Use the navigation sections at the left to learn more about California grapes and the commission. Have questions? Send an email to info@grapesfromcalifornia.com or call 559.447.8350. The California Table Grape Commission has an extensive library of photography, recipes and other support materials that can assist editors and reporters writing for general news, food, science, lifestyle, specific trade audiences or social media needs. Email the commission at info@grapesfromcalifornia.com to ask about any of these resources or other information relating to California table grapes that might be helpful to your research. We hope you find these resources useful and look forward to your comments so we can continually improve your access to grape-related information.